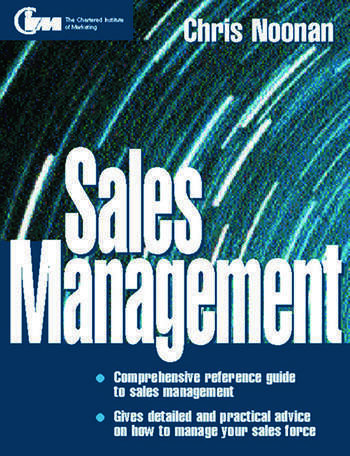 Sales Management is a complete and practical handbook for all involved in the field of selling. It is an essential source book, a complete sales management course and a consultant's detailed plan in one volume. The sales manager needs all the skills and qualities of the salesperson in order to get things done by effective management of an often quite diverse team of people. The emphasis in his or her role is on planning, controlling, monitoring, managing and motivating their sales force. Step-by-step, the book provides detailed guidance to the practicalities of organization and management, including selection, training, motivation, communication and control. The author also gives in-depth analysis to such vital topics as forecasting and sales promotions, the use of planning and control forms and alternative sales distribution methods, such as franchising. It will be key reference and reading for every practising sales manager at area manager level and above in large corporations, and the field or local manager in smaller companies with less structured organizations. Functions and organization of the sales force - Roles and functions in the sales force; Sales structures and organization; Developing a motivating sales environment - Motivational management in the sales force; Sales management by objectives; Motivating through rewards and incentives; Providing appraisals and feedback for motivation, training and discipline; Communication in the sales force; Sales meetings and conferences; Sales recruitment and training - Recruitment and selection in the sales force; Basic sales training; Field sales training; Planning, forecasting and performance monitoring - The planning process; Sales forecasting; Performance monitoring; Management and control of the sales force - Territory management; Sales force administration; Sales management control; Developing the business - Trade development; Sales promotion; Merchandising at the point of sale; Key account management; Alternative sales or distribution operations; Developing international markets; Index.